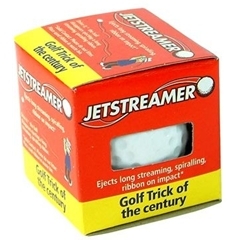 The Jetstreamer is a trick ball with a difference. Drive it (yes, you have to actually be able to hit it) and it will eject a long, streaming, spiralling ribbon. Have you ever seen that before? Try a crafty ball switch on a 'friend', or make a distance bet just to see the reactions. They'll love it. Another great addition to the range of Trick golf balls we have available.